Corry Micronics offers a line of 4 bit through 6 bit RF digital attenuators. The digital attenuators are designed using switched bit pin diodes. The attenuators require /-5volt power supply and feature TTL compatible control logic. Corry Micronics also offers a high REL option that includes screen to the MIL-STD-883. Corry Micronics’ voltage variable attenuators are current controlled for high performance, compact design and are very cost efficient. For the cost conscious buyer we offer the reflective style of voltage variable attenuators. For those designs where any stray reflections would cause system performance degradation we offer the non-reflective voltage variable attenuators. Our attenuators are designed with a wide range of attenuation from 2db to 50dB in the reflective and 30dB in the non-reflective attenuator. We leveraged our pin diode design expertise into our line of Pin diode limiters. Limiters are used to protect sensitive active components such as low noise amplifiers (LNA) or transmitter receiver front ends. Limiters reduce the amount of power that these sensitive circuits receive. Our limiters are designed to handle up to 100Watts of peak power. We also custom design microwave phase shifters. 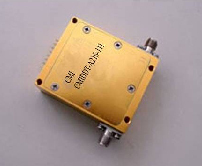 These phase shifters are available up to frequencies of 8 GHz and designed with 5 bit resolution. PDF on the complete line of attenuators.